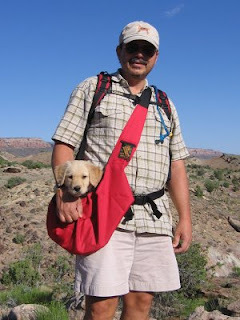 In the "Scout comes home" post from a couple of weeks ago, I mentioned that Nan and I had taken Scout for his first hike in the desert, but there weren't any photos because we had forgotten to take the camera. This morning we remembered. Nan was able to snap a few good ones as we hiked in the Tabeguache area near our home. Scout is now a day shy of nine weeks old, and he can already do most of the Kurt's Lane/Lemon Squeezer loop, a distance of about 3.5 miles. The key is to get there early, around 7:00-7:30, when it's still cool enough and to provide him with frequent drinks of cold water out of the CamelBak. On this morning's hike, Scout went around me a few times to take a short lead. He'll stay out front until he gets confused about which way the trail goes, and then drop back behind me. In this way, he will learn to follow a trail and take the lead most of the time, just as Charlie did. 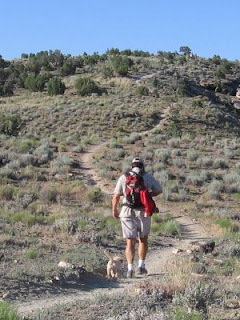 The trails have been busy lately, with everyone trying to get in their hikes, bikes or runs before the temperatures rise into the high 90s and low 100s. All the traffic has helped with Scout's socialization. He eagerly runs to meet every person and dog we encounter. This morning he even got to meet a couple of horses. Scout lets us know when he's tired or overheated by lying down in a shady spot. That's our cue to put him in his sling for a rest. He enjoys the ride for a while and then gets fidgety to be walking on his own again. By the time he's too big for the sling, he'll be a strong, reliable hiking companion and we'll be able to hike everywhere together. Just stumbled on your blog. Enjoyed reading it. I have a couple out there--not nearly as well-developed. I've returned last fall from living on a sailboat in Seattle for 2 years. It was the realization of a dream. The dream's still there but is on hold. QWEST allowed me to transfer out there so i sold everything in Denver & arrived in Seattle with a small trailer filled with my "necessities". I have sailed small boats on inland waters all my life but was new to the ocean & living aboard. i arrived in june & didn't want to lose the precious summer months searching for the perfect boat--a big project as you know. So i bought the third boat I looked at--a Cal 34. It turned out great--was in better than new condition--but it was too small & not what I wanted for a life of cruising. So for $500 I enlisted Bob Perry, the designer of the Valiant 40, to help me look for the next boat. I ended up with one of his designs--the Islander freeport 36. I bought it for the headroom, light from large portlights, large head & pullman berth. Unfortunately, the deferred maintenance was overwhelming, the surveyor missed a lot of faults, and the galley was at best awkward, and i learned that even with a full cockpit cover i was rarely warm enough out on the Sound. (Visibility was so poor from the cockpit all zipped up that it didn't really give me the protection I wanted to sail year-round.). After arriving back in Denver to stay the winter, I got a message that the dock I was on was being leased out & i was losing my slip. i listed the boat with a broker & to my surprise she sold it right way. I'm headed for MN in July to care for my parents for the summer, then hope to resume the cruising/sailing/liveaboard life. I'll be back where you are, trying to buy a boat long distance. it's very frustrating! And I want this to be a boat I can keep for a while! I'm in love with (that's the worst of it --the emotional side) a boat in CA--a Challenger 42. It's well-outfitted & looks like the layout I want--but I face the same thing you do--a lot of expense to go look at it, knowing that pictures lie & with one glance I could discover it's not for me. It's a lot like computer dating! I would encourage you to charter & sail with others a lot before you buy if at all possible. I belonged to a club in Seattle that met Monday nights. Skippers would line up & invite members to go on free trips every weekend. Club cost $15/meeting or $140 for the year. It was a great way to get rides on a variety of boats. Having said that, I bought the Cal 34 based on reputation without ever having sailed one & it was a good boat for me. i didn't spend a lot on her & sold her for more than I paid. if it weren't for sales tax, I probably broke even. The Valiant 40 has the same kind of reputation. I think the owner's group is a better bet for finding a good boat than Yachtworld. But i scan Yachtworld every day. Problem is, most of the boats that are on Yachtworld forever are there for a reason. They're in bad shape or the owner is unrealistic about value. After my experience with the Freeport, I'd recommend waiting for a well-maintained boat. Unless you can do all the work yourself, bringing a boat back from neglect can easily cost more than the initial purchase price. It's hard to find people that do good work. And a boat that needs work is a pain. You can't trust her to really go anywhere. You never recapture that money when you resell her. The guy on the east coast is not going to sell her for any more by installing radar & whatever else he's doing. I think letting the boat go on the east coast was a good choice. Where do you plan to start from--whereever you find a boat? Thought it might be interesting to stay in touch. RE: Good luck in your quest! Thank you for contacting me. I enjoyed your message and all its good advice. It sounds like we are sharing the same dream but that you have at least experienced some of it firsthand already. I, too, grew up sailing on inland lakes, mostly in Wisconsin, but dreamed of sailing the oceans and circumnavigating. I have taken the ASA classes, chartered in the BVI and gone on two of John Kretschmer’s trips (http://www.yayablues.com/ and Latitudes & Attitudes magazine), but I have never owned a boat other than the 1969 AMF Alcort Minifish that’s out in my garage. After the disappointment with “Little Walk,” the boat I looked at in Virginia, I’m thinking I may have to do what you did and enlist the assistance of an expert to help me locate the right boat, maybe Stan Dabney (http://www.offshoreyachts.com/), the reputed Valiant 40 authority next to Bob Perry, the boat’s designer. I emailed Stan once and he was very helpful, so it might be worth a try. 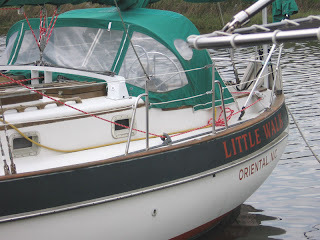 The one thing that looking at “Little Walk” did do was to confirm that the Valiant 40 is the right boat for what we have in mind, so I’m pretty set on it if I can find a well-maintained one at a decent price. With the crummy economy and our landbound life in Colorado, my wife Nan and I (and our new dog Scout) may be a few years out yet, but it never hurts to keep looking. When we do finally find the right boat, the big trip will probably start from where the boat is located, at least to a certain extent. Having sailed in the Caribbean more than anywhere else, that would be my preferred starting spot. If I locate a boat on the west coast, like the two Valiants that are currently listed on YachtWorld.com in the Seattle area, I think I would sail south and then east through the Panama Canal, and then up around Florida and up the east coast at least as far as Savannah, where my parents have a vacation home on Skidaway Island, before thinking about backtracking by way of the Bahamas, the Caribbean Islands and the northern coast of South America to return to the Panama Canal. I am a big fan of Robinson Crusoe and Mutiny on the Bounty, so it has been my dream to sail across the Pacific by starting at Valparaiso, Chile and making landfall at Alexander Selkirk Island (in the Juan Fernandez archipelago) and Pitcairn Island on the way to French Polynesia. From there, I have some route ideas that involve New Zealand, Australia, Madagascar, Africa and the Mediterranean, but they’re too much to list here. The biggest idea would be to undertake a circumnavigation in a discontinuous way, leaving the boat at desirable spots along the way during bad-weather seasons and flying home to take care of real-life responsibilities before returning to pick up where we left off. I met Jim Whittaker, the first American to summit Mt. Everest, about eight years ago, and this was how he and his family were working their way around the world. It might take quite a bit longer to do it this way, but I look at the dream as being an “until I die” kind of thing anyway, so there’s no need to rush through it. Let’s stay in touch and see how the dream works out for the both of us. 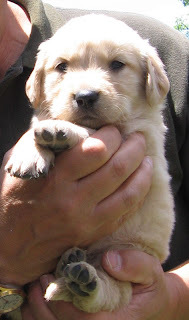 On Saturday morning, we drove to Roosevelt, Utah to pick up Scout, the golden retriever puppy that Nan is giving me for my fiftieth birthday. The breeder and her family were in Roosevelt for a stock show, which worked well for us since it is a couple of hours closer than Provo, where we drove two weeks ago to pick out our puppy. We expected Scout to whine and howl on the three-hour drive home, but he slept in Nan's lap most of the way, occasionally waking up to look calmly out the window at the passing scenery. 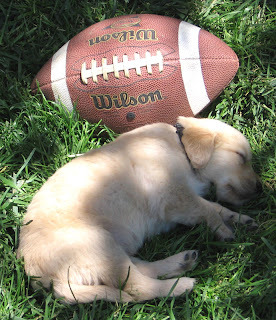 For a seven-week-old puppy, he is remarkably confident and well-socialized. Scout spent the first afternoon and evening settling into our home, and we spent it following him around to make sure he didn't pee or poop inside. 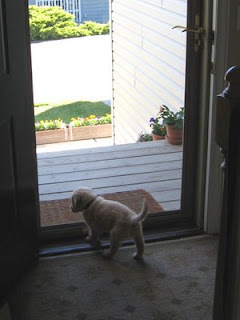 Fortunately, puppies usually give a little advance warning, sniffing the carpet and making little hopping spins, so you have time to scoop them up like a fumbled football and run them outside. We are crate training Scout to expedite his house breaking. The idea is to put the puppy in the crate at night and during short unsupervised periods during the day to prevent him from eliminating in the house. Dogs, even very young ones, will not eliminate where they sleep, so they quickly learn to control their bladders and bowels while in the crate. At night our crate, a medium-sized plastic transport box with a wire mesh door, sits next to my side of the bed. The first night was a long one. Scout woke me up almost every hour whining to be let out of the crate, sometimes because he needed to pee and twice because he soiled in the crate. We weren't sure if it was stress or the hot weather, but Scout had developed diarrhea that first evening. The second night went better. Scout woke me up only twice, both times to pee, and he didn't soil his crate. So there's some hope for tonight that I may get a full night's sleep. This morning we took Scout for his first hike in the desert near our home. It was hot and buggy but he did better than expected. He is at that stage where he wants to follow us everywhere, so we let him follow us down the trail. He willingly took water squirted from our CamelBaks, and when he tired I carried him in the doggy sling Nan gave me as a birthday gift. 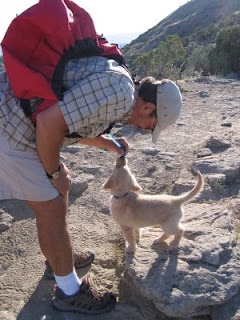 Scout already seems to be on his way to becoming the same terrific hiking companion that Charlie was. Today is only the second official day of the 2008 presidential election, but it's already looking like Barack Obama will win it easily. Almost four years ago, when Newsweek started running his photo and announcing that he would be the keynote speaker at the Democratic National Convention, I was one of many asking, "Barack who?" But then I watched his speech, and I was one of many thinking, "This guy is going to be our first black president." Later that year, when Obama won his senate seat in the 2004 election, I was one of many thinking, "He's on his way." In early 2007, following the huge Democratic victories in the 2006 mid-term elections, when Obama was considering a run for president, I was one of many hoping he would take the chance. Back in March, when he easily won the Iowa primary, I was one of many who were not surprised. And when he became the Democratic candidate for president last Tuesday, I was one of many thinking, "I can't believe this is really happening." Now we face five months of what will be the most contentious presidential campaign in history. It will start with the choices for vice president. I am one of many hoping Obama chooses Jim Webb, the Democratic senator from Virginia. Webb, a Vietnam hero and former Republican in the Reagan administration, would provide excellent balance to the ticket. I am also one of many hoping John McCain chooses Mitt Romney, the former governor of Massachusetts and former presidential candidate. Long on money and short on ideas, Romney could provide a "Quayle effect" that further muddles an already seriously muddled Republican campaign. Faced with such an overwhelming opponent, the Republicans will go ugly early. They will make John Kerry's 2004 swift-boating seem like a friendly scrimmage by comparison. I am one of many who will be thinking, "There is nothing they can do now that will change my opinion." Barring unforeseen circumstances, the change this country so desperately needs will begin on January 20, 2009 when Obama is inaugurated president. I am one of many who couldn't be happier. Stephen, the salesperson representing "Little Walk," the Valiant 40 I looked at in Virginia, emailed me back with some answers to my questions. The JRC radar I noticed, which was not included in the online listings, is one of the upgrades and improvements the owner is making in order to increase the asking price from what it was, $80K, to the "fair market value" of $95K. The slip does convey with the sale, at a monthly rate of $140. And there is a recent survey, but it is only viewable at the sales office because it is the property of the person who paid to have it done. As a person who started inquiring about the boat before the price increase, Stephen indicated that I would be allowed to make an offer at the original price. Frankly, I was thinking an offer in the $65K to $75K range would be more in line based on what I saw of the boat's condition, even if all the systems were in good working order. There was a look of benign neglect to the boat, both inside and out. The deck fiberglass was oxidized, and there were impact cracks repaired with epoxy in several places. The plastic frames around the hatches were dried and cracked. The mast boot was sealed with duct tape, and the dorade cowls were black with growth. The inside looked like a bachelor's apartment--dark, cluttered and grungy. Even though my first impression was not overly favorable, it was still a Valiant 40 and therefore worthy of consideration. I thought to myself, if I hauled all the stuff out of the boat, gave it a thorough cleaning and shining, replaced some parts and painted others, and put back just the necessary stuff, it would be almost tolerable, again provided that all the systems were in good working order. 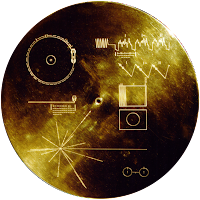 Since nobody was available that day to demonstrate the systems and since the survey cannot be faxed or mailed, the only way to figure out whether it would be worth putting any money and effort into this boat would be to make a second trip out there. At this point, I'm thinking it's probably not worth it. A better-maintained boat of about the same age and in about the same price range will show up in the listings someday, and by then maybe the economy will have improved somewhat to make it more affordable. I'll continue to scan the online listings in the meantime. If you happen to know of a good, used Valiant 40 that's available for sale, please let me know. Thanks. 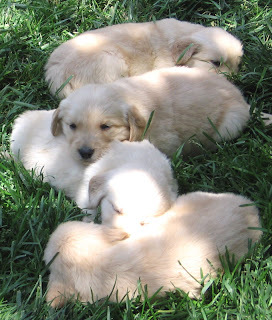 While I was out in Washington, I accidentally uncovered a secret Nan had been planning for my upcoming 50th birthday: a golden retriever puppy. At first I was uncertain. The timing seemed wrong, coming just two months after our dog Charlie's premature death from cancer. There is still not an hour that goes by during the day that I don't think about him. A hinged frame containing one of his last photos and a paw print impression sits on my desk next to my computer display. I glance at it often, sometimes thinking to myself, "Good boy." Would it be disrespectful to his memory to bring a new dog into our lives so soon after his departure? I grappled with that question for several days before concluding that Charlie would probably just want us to be happy. So we are going to invest the love we will always have for him in a new puppy, pouring into him all that we have learned from raising Charlie. Yesterday we were in American Fork, Utah to look at golden retriever puppies that Nan found through the Breeders.com website. The owners of both the father, Titus, and the mother, Annie, were on hand at Annie's people's home to show us the litter of four males and five females. They were born on April 28, so they are just five weeks old. At that age, they look and act very much alike, but they all exhibit the great looks, sturdy bodies and friendly dispositions of their parents. Nan and I agreed to choose a male, but it was a tough choice. We talked with the owners and played with the puppies and their parents for almost an hour before picking one of the darker, more outgoing pups and putting a small black collar around his neck. This will reserve him for us until we can return in two weeks to take him home. 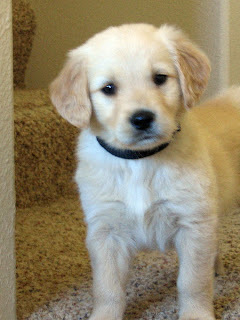 We puzzled over a good name for the puppy, with Nan telling me repeatedly, "He's going to be your dog. You should pick his name." I had it narrowed down to "Yogi" or "Scout," and Scout won out. It has a nice ring to it, and it is associated with two well-known characters, Tonto's horse and the young narrator from To Kill a Mockingbird, one of my favorite books. It also brings to mind an image of Charlie wearing a bandana and looking like a "dog scout." I think the name will suit our new puppy just fine. Welcome to the world, young Scout!